was this art one of the easiest? 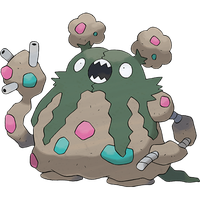 I would suspect that the primary anatomical difference in Alolan Grimer would be the presence of a massive vacuole-like organ to allow for the consumption of greater quantities of detritus at a time. I think Ditto would be an interesting one. in my opinion ditto would be a multipurpose slime anatomy! The Slime Molds are like this. It has also been found, according to Alan Alda, that they are capable of learning ,navigating mazes faster than humans can. Hive minds. See, like I keep telling people, Grimer is a _good_ design, unlike Diglett. Thanks for making this lil' blob cool again (and you didn't even have to mention chemical waste being hit by cosmic rays from the moon). Did somebody say GARBODOR? Well, if you insist. Why didn't I discover this sooner? This is amazing! This is so neat! Pokemon and science. I was really curious how you would give anatomy to what was designed to be sentient sewage, but you pulled it off brilliantly. Thank you! If you enjoy this, I recommend doing some research on the reproductive stages of slime-molds. Grimer's fictional biology is based heavily on them, and they are EXTREMELY weird organisms. Only a anatomy genius could come up with something this complex for a sentient blob of Bactria,keep up the good work. Agree with what they say... I love how you handle the more unusual types of Pokemon like this one and Exeggcute and Voltorb. Takes a lot more creativity and planning to explain their bizarre biology. Ooh, I'll have to do that. I love it when truth is stranger than fiction.